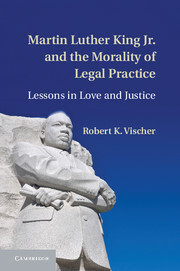 Next month, Cambridge University Press will publish Martin Luther King, Jr. and the Morality of Legal Practice: Lessons in Love and Justice by Robert K. Vischer (U. of St. Thomas School of Law). The publisher’s description follows. This book seeks to reframe our understanding of the lawyer’s work by exploring how Martin Luther King Jr. built his advocacy on a coherent set of moral claims regarding the demands of love and justice in light of human nature. King never shirked from staking out challenging claims of moral truth, even while remaining open to working with those who rejected those truths. His example should inspire the legal profession as a reminder that truth-telling, even in a society that often appears morally balkanized, has the capacity to move hearts and minds. At the same time, his example should give the profession pause, for King’s success would have been impossible absent his substantive views about human nature and the ends of justice. This book is an effort to reframe our conception of morality’s relevance to professionalism through the lens provided by the public and prophetic advocacy of Dr. King.